It’s that time of year again! We’ve dusted off the garden tools, kayaks, golf clubs, and camping gear and we’re enjoying our many days of sunshine here in Colorado. While you are getting your gear and your body in shape, don’t forget the sunscreen! According to the American Cancer Society (www.cancer.org), skin cancer is by far the most common form of cancer in the United States. These cancers are caused by exposure to UV rays, primarily from the sun. The good news is that we can take some very simple but important steps to have fun in the sun and stay healthy! Slip on a shirt. Clothing can block UV rays, and more clothing blocks more rays. A longsleeved shirt is better than a t-shirt, long pants better than shorts. Some manufacturers add coatings to fabric and provide UV protection factor (UPF) ratings for their clothing. Slop on sunscreen. Use a broad-spectrum sunscreen that protects against UVA and UVB rays. 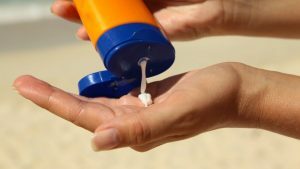 The Skin Cancer Foundation (www.skincancer.org) recommends a Sun Protection Factor (SPF) rating of SPF 30 or higher for prolonged or intense sun exposure. Use at least one ounce for total body protection (about a shot glass full), apply 20-30 minutes prior to exposure, and reapply every two hours. If toweling off after swimming or sweating, reapplying more often may be needed. If you are using sunscreen and bug spray, apply the sunscreen first. SPF30 lip balms are also available. Slap on a hat. A broad-brimmed hat provides protection for your face, ears and neck. A shade cap with fabric around the sides and back also provide good protection for the neck. The Slip, Slop, Slap® campaign now includes recommendations to Seek (shade) and Slide on a pair of sunglasses that provide UV protection. Protection from exposure to UV rays can reduce your risk of skin cancer, but early detection is essential too. Know your own skin, including your patterns of freckles and moles, and talk to your doctor about skin exams or if you see anything suspicious. Take care of your skin while having fun in the sun, and stay In the Pink this summer! February is approaching, and our thoughts often turn to Valentine’s Day and matters of the heart. Candlelight and flowers are wonderful, to be sure. The Matters of the Heart I would like to focus on here are about heart health. February is American Heart Month, kicked off each year with National Wear Red Day, the first Friday in February. National Wear Red Day, February 2 this year, is an effort to raise awareness of a very important issue for all of us: heart disease in women. 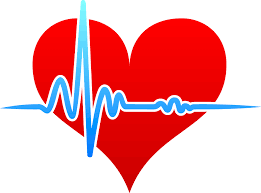 According to the American Heart Association, heart disease claims the lives of more women than all cancers combined! It’s important to get your mammograms, but please, don’t forget your heart!! What can you do? The first step is being aware of your risk for heart disease. Talk to your doctor about your heart health, and get to know your numbers—blood pressure, cholesterol, blood sugar, and body mass index. Check out this Go Red for Women web site from the American Heart Association: https://www.goredforwomen.org for more information. In the meantime, dust off that little red dress (or sweater, or sneakers) and celebrate National Wear Red Day to support the effort to Go Red for Women! Don’t have anything red? Check out the Red Dress bling at ShopHeart.org. Lots of fun items to help you show your colors! This is the first installment of a new ATL series on health and wellness. Watch this space to stay In the Pink! Can’t make an Event? Donate Here!